In 2009, three fresh-faced teenagers, tenors Piero Barone and Ignazio Boschetto and baritone Gianluca Ginoble, appeared on the popular Italian talent show ‘Ti Lascio Una Canzone’ and dazzled television viewers with their flawless rendition of ‘O Sole Mio’. 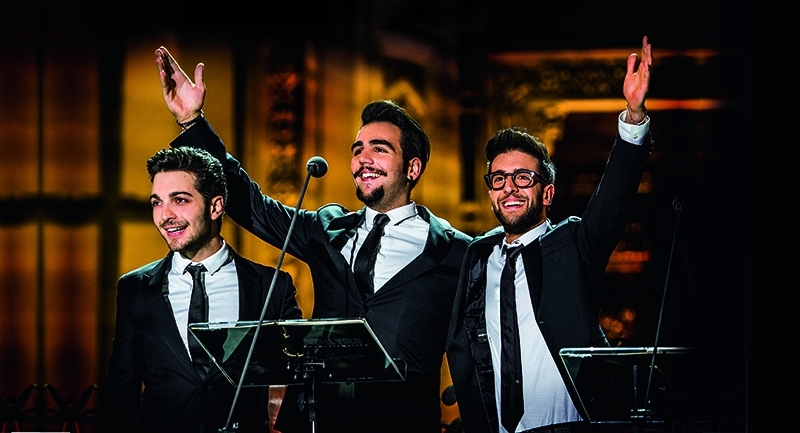 Originally ‘I Tre Tenorini’, the group’s name was later changed to Il Volo meaning “flight,” to signify they were about to spread their wings and fly. In just a few years, the trio have performed worldwide, toured with legends such as Barbara Streisand and sang with Eros Ramazotti, Anastacia and Plácidó Domingo. They contributed to the 2010 charity single ‘We Are the World 25 for Haiti’, a rendition of the 1985 hit ‘We Are the World’. In 2010 the group recorded their debut, self-titled album in the Abbey Road Studios in London, England, which featured the national and international numbers ‘Il mondo’, ‘Un amore cosí grande’, and Charlie Chaplin’s ‘Smile’. Issued by Geffen Records in November 2010 the record peaked at No. 6 on the Italian Albums Chart, which signified their mainstream breakthrough. At their first concert in Budapest, the award-winning operatic pop trio will be accompanied by the Óbuda Danubia Orchestra, conducted by Marcello Rota.